Recognized as an established, Taiwan-based supplier and manufacturer in the machinery industry, H. S. Machinery Co., Ltd. has been offering its customers quality vacuum pump, pump-control valves, cast iron, and pumps since 1961. With both advanced technology and professionalism, the supplier is sure to meet each customer's demand. 1. Structure is designed for easy installation and maintenance. 2. Multi stage filtration system ensures minimum leakage (less0.1%) of lubrication oil. 3. 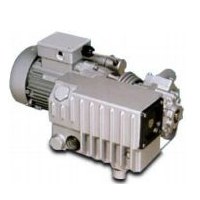 The pumps are driven by high efficiency induction motor with nature air cooling system only and required no liquid. 4. All components are processed under strict quality control. This enables a quiet rotation and fast pumping speed. 5. The pumps are widely used in food processing, packaging, hospital, thermoforming, printing, PCB testing, vacuum handling.